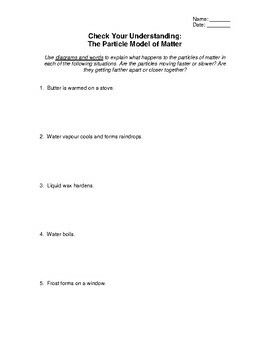 This worksheet acts as a comprehension check after students have learned about the particle model of matter. There are 5 examples of everyday activities (ie: butter being warmed on a stove), and students are asked to use diagrams and words to explain what is happening to the particles in each scenario (are they moving faster or slower? closer together or further apart?). This worksheet is very easy for teachers to mark, and works great as a quick check-in part way through a science unit.